Fascinating insights into the carrying of bamboo poles by acupuncturists in China appear in a book by author Ioannis Solos. It confirms the importance of the bamboo pole in ancient Chinese traditional health. 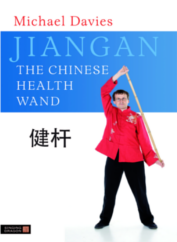 We can understand how the `wand’ developed into a branch of Qigong, as first presented in Bruce Johnson’s book and also supported by documents found in China. The remnants of the ancient traditional Chinese medicine practitioner can be seen in Chinese history, and frequently manifests as the `beggar’ with bamboo pole in popular depictions. There are also real life photos – some going back to the 19th century – of Chinese carrying bamboo wands. When the Chinese Health Qigong Association devised their tai Chi Qigong Stick Routine a few years ago it did not take long for Chinese people to start using bamboo poles. This shows the long held connection between bamboo and martial arts and health exercises in China. Bruce Johnson mentioned that he worked as a fitness instructor for Paramount Studios during the sixties and taught the wand exercises to many famous stars, including James Coburn, who became a dedicated wand practitioner. Here is a newspaper article mentioning Coburn practicing the wand exercises, taken from the New Straits Times, Jan 23, 1976. (Click on image to enlarge). 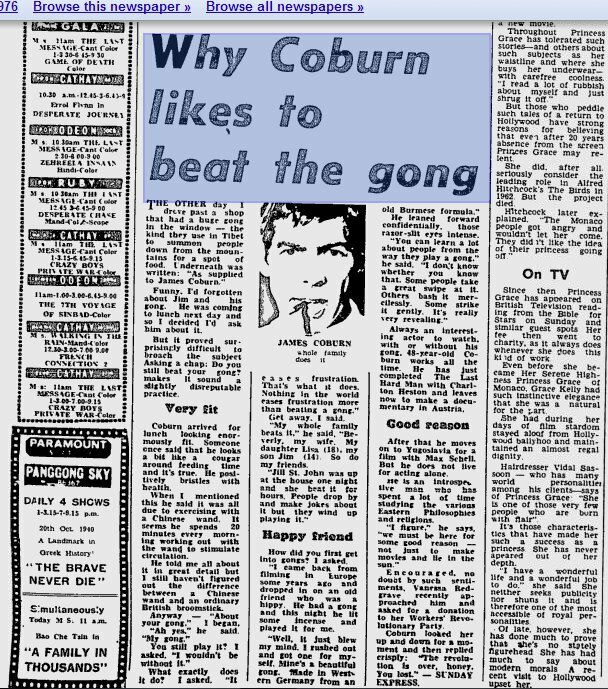 There are other articles about Coburn practicing the Chinese Wand, notably the Chicago Tribune dated Aug 26, 1978, which I have – but can not reproduce because I do not have the copyright. I believe that there are also at least two photos of Cuburn practicing the wand but they are again copyrighted and difficult to get hold of. 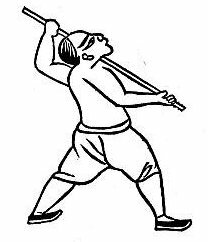 Several years ago I received an email from someone who said that there was no mention in Chinese history of a Qigong-like exercise using a stick or bamboo pole. This person was wrong. Research has confirmed Bruce Johnson’s claims that the Wand exercises are indeed of Chinese origin. This article is just a brief overview but I have collected a great many photos, videos and descriptions of wand exercises in China. 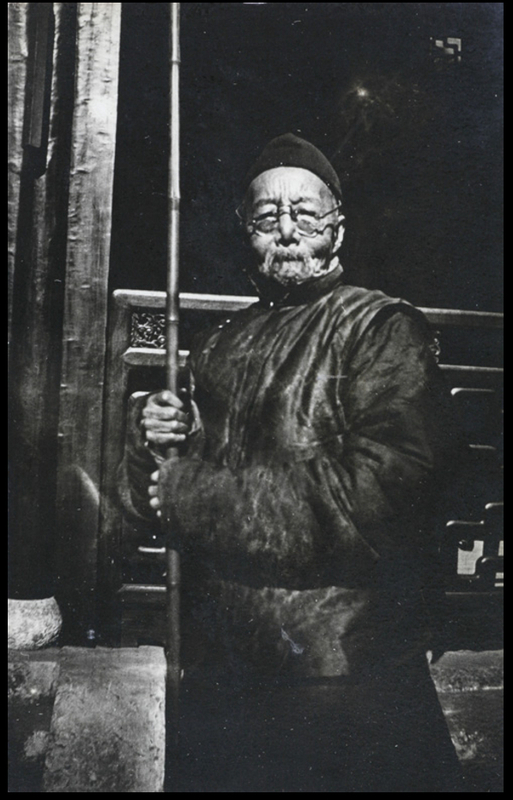 The Chinese Government recently presented historical evidence that wands were used to aid exercise and enhance Qigong in ancient times, as Bruce Johnson asserted in his book. The Chinese Health Qigong Association studied Qigong stick methods and created a new routine called the Taiji Yang Shen Zhang. Interestingly, the wands they use to demonstrate this routine are about four-foot long, the length Johnson maintained was traditional and most beneficial. In fact, many of the techniques introduced to the west by Bruce Johnson can be seen today in China. For example in Taiwan there is a method which is undoubtedly an offshoot of the techniques Bruce Johnson learned on the mainland. 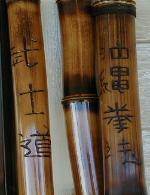 More about Chinese Wands in Taiwan here. Some ancient qigong techniques have startlingly similar postures to the Chinese wand floor exercises. 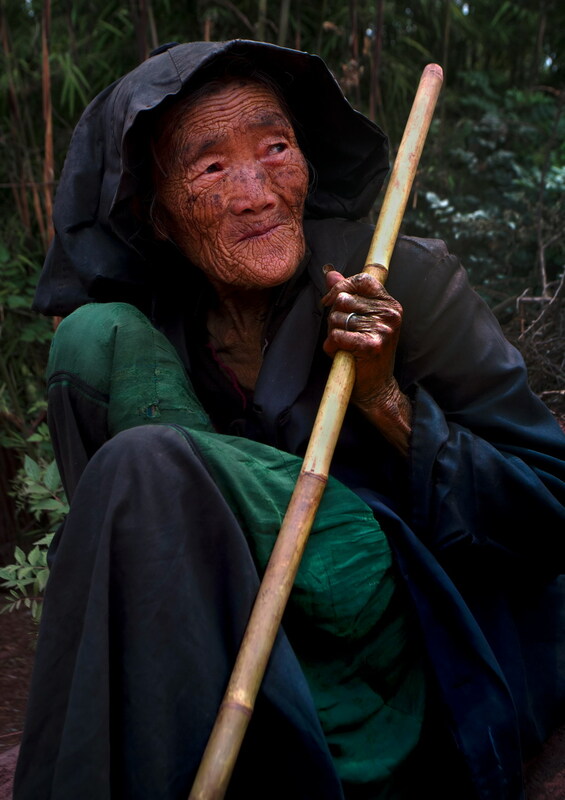 A wand practitioner I know in England demonstrated the exercises for an elderly Chinese woman, who claimed to recognise several movements (which appear in Bruce Johnson’s book) and said they were practiced by Taoist monks in the Wudan region of China. This is the strongest evidence yet that Bruce Johnson was correct in saying that the techniques in his book were taught to him by his Chinese teacher in Shanghai. There is just one more aspect of Johnson’s assertions that need to be researched – the use of bamboo for the wand itself. If we could find a wand practitioner in China using bamboo it would boost the case for bamboo poles – rather than poles in general, being used in China’s for heath and fitness since ancient times. There is one examples – a video showing a Chinese gentleman performing a new routine very gracefully with a four-foot long bamboo pole. 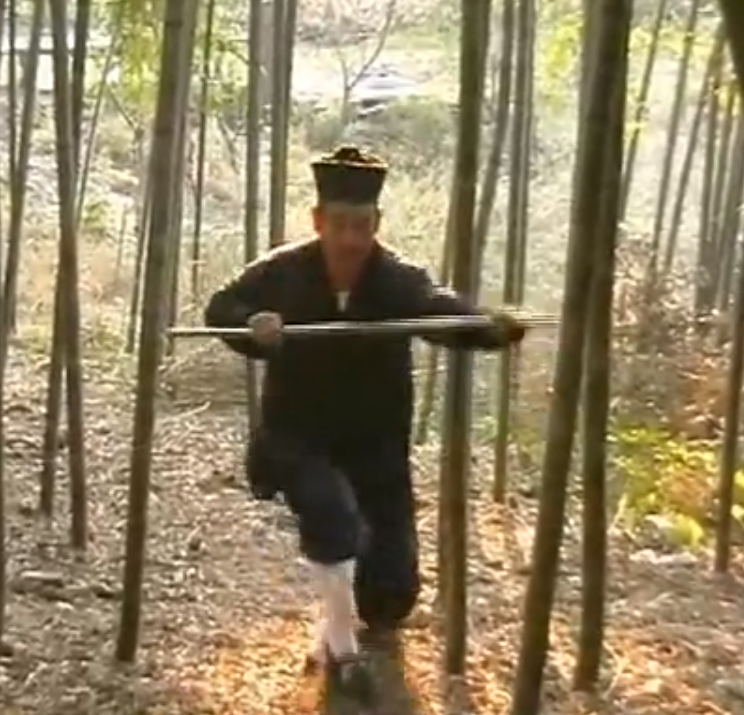 Although the routine is new it shows how natural it is for the Chinese to use bamboo for this type of exercise. I recently discovered, via a Jiangan practitioner, an old Chinese person living in the West who has practiced wand exercises since childhood. This person originally comes from the WuDang area of China. When shown the techniques of Jiangan 17 Exercise Routine this person recognised some. In fact, the Wudang area was on my `shortlist’ of places where wand exercises may still be practiced in China as an exercise, rather than a martial art weapon, even if it is only `behind closed doors’. 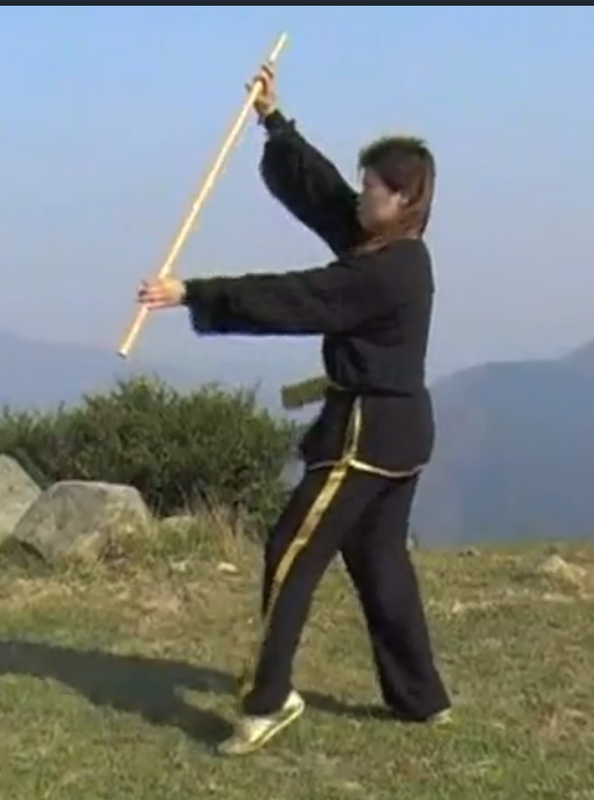 The `Wudang Kung Fu Short Staff” is about the same length as the pole used in Jiangan. 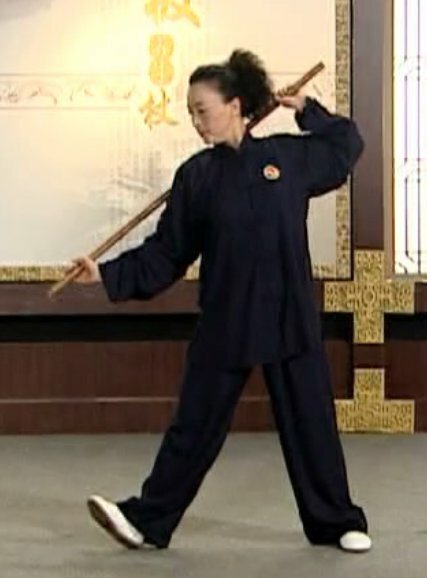 The WuDang Staff is a martial art but it can be adapted for the fitness exercises. Research is still ongoing to discover how many people in the region still practice health and fitness wand forms and how closely they relate to the 17 Exercise Routine. Bruce Johnson’s describes his introduction to Dr Cheng, his teacher, in the first chapter of his book. The meeting took place in old Dr Cheng’s house in Shanghai in 1945. It was in a room full of bamboo furniture that Johnson first saw the four-foot wands he was later to use in the exercise he would bring to the West. There were carvings of images and Chinese characters on the wands. Some were ingrained with pieces of copper, which is thought to retain the body’s Qi energy). The Chinese believed that copper was connected to health and `Qi vitality’. 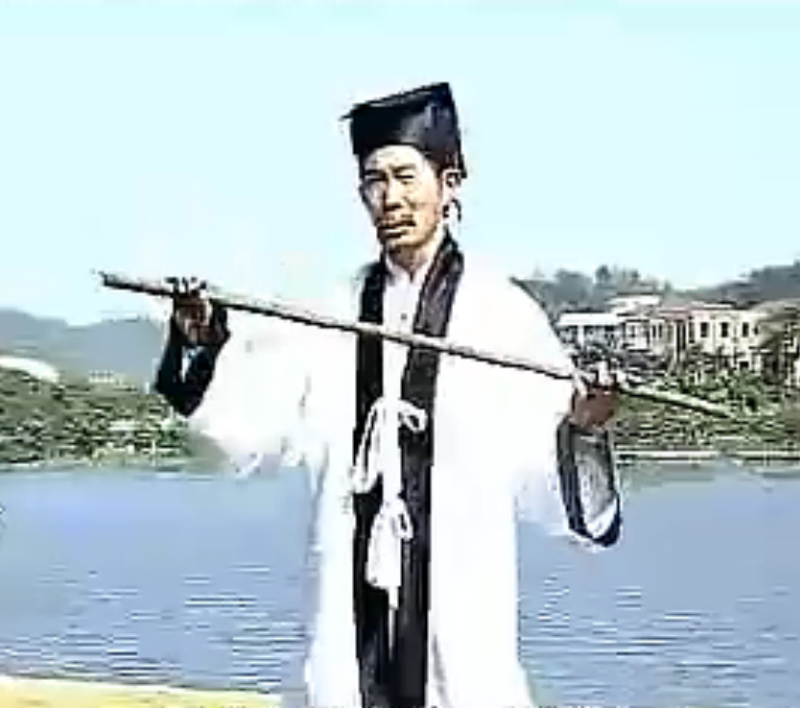 The three-foot wands of Taiwan’s `Qigong-rod’ system may be the closest relative to Jiangan. Some techniques are similar to the ‘s standing exercises but other techniques involve massaging and stimulating acupuncture points in the body. 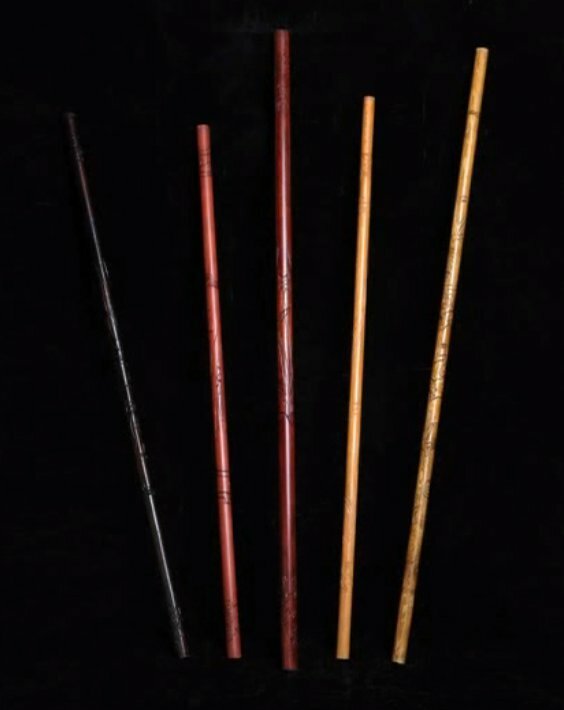 The wands, made in three sections that join together, are embedded with greenish-black spots of copper the way described by Bruce Johnson in his book. The Association’s book does much to support the `meme’ of carved wands for health exercise in Chinese culture. Young Wand Master of old China? Wandmasters were members of the Chinese gentry who were skilled at practicing a comprehensive method of health and fitness that required the aid of a four-foot pole or `wand’. The ancient and gentle art is extremely efficient in keeping the physical body in shape (useful for the gentry who had little physical activity) and is a powerful type of Qigong. A few months ago I found a photo in an archive of a possible `Wandmaster’ of old China. 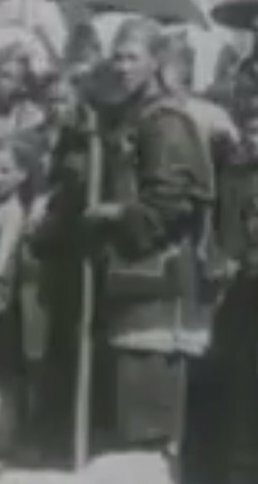 I have recently discovered a film dating about the same time (1900) that appears to show a younger Wandmaster. The extract below from a movie posted by SOAS on Youtube, shows a young well-dressed man with a bamboo pole about four feet long. During that period, beggars often carried poles. But he is obviously not a beggar. He looks healthy and robust and does not appear to need a pole to support his body. Is he a coolie (porter) who uses the pole as a yoke (to carry objects over his shoulders)? Unlikely, because he is far too well dressed for that. Does he have the pole as a weapon to defend himself? 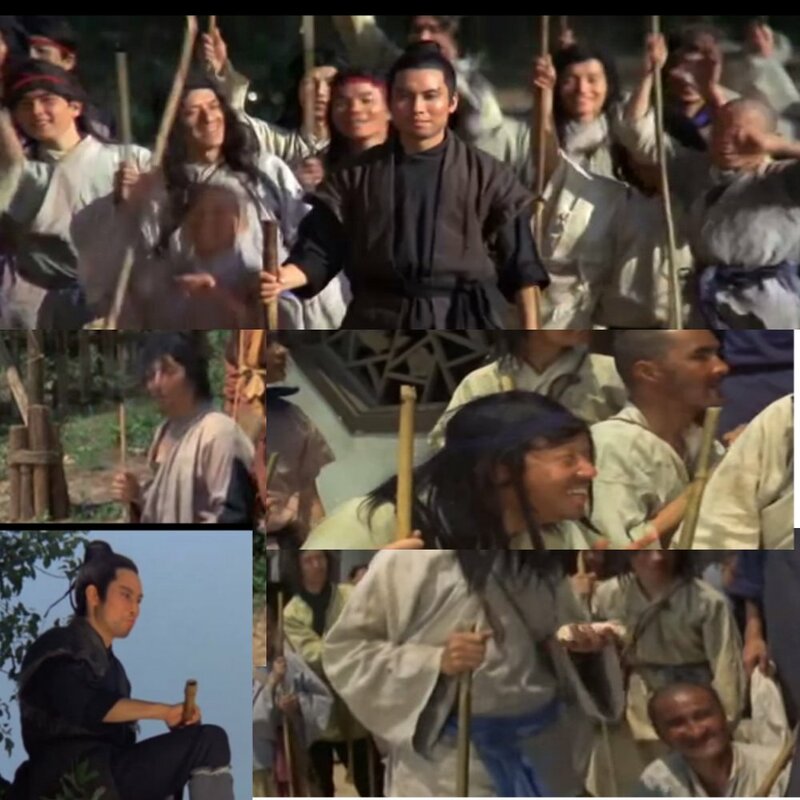 This length of pole/staff is not common in the Chinese martial arts, and while it could be a weapon, we have, in Bruce Johnson, an account of how poles of just this length were used as a fitness and qigong exercise, mostly by the gentry and wealthy. Its a fascinating photo. My research revealed that Jiangan is the product of evolution, and that is how I have always approached it. The art contains intelligent design for the important aspects of health and fitness – a comprehensive system and `optimum method’ of stretching, strengthening various parts of the body. The most important understanding is that it was not created overnight by an individual, or patented and packaged by a committee to make money, but evolved over generations, centuries, of trial and error and input from masters, to make exercising the body safer and more efficient. Jiangan exercises are the most efficient, effective and powerful general fitness exercises I have discovered. After exclusively studying the art, my body has become stronger, my breathing capacity increased and I have become trimmer. Sadly, because of advertising `overkill’ by those marketing exercise systems, the above claims will sound rather corny and induce a “yeah right” attitude. But I am not trying to build a health and fitness franchise or make money from this art. My intent has always been that age-old knowledge should not be lost. The basic intelligent design work has been done on exercise. Of course, evolution will go on, and we may discover more efficient, safer and convenient methods of exercise in the future. But I do caution about starting again and reinventing the wheel. We should make use of knowledge of the past and what the masters discovered.